There is a strain of horror books set in cabins. Remote settlements far from civilisation where anything can happen. The opening of Iain Reid’s Foe recalls these books. A couple who live on a small farm surrounded by mutant canola fields, a place where no one ever comes, receive a visitor. So begins a tense, three handed dance between the couple and the intruder. 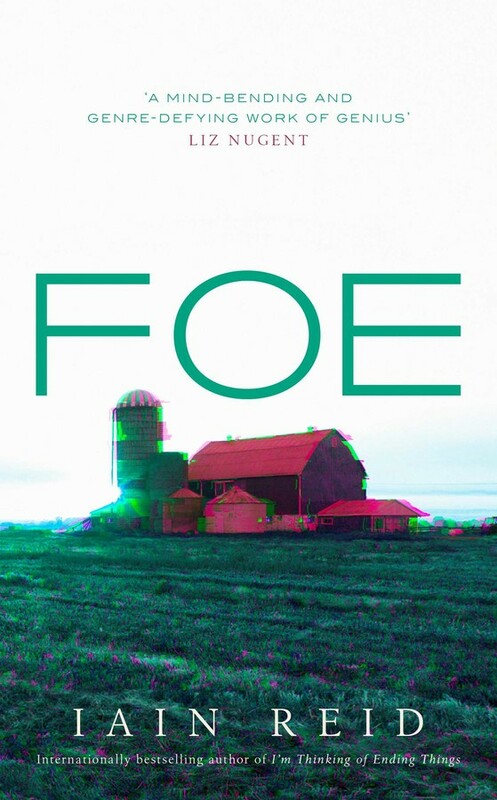 The underlying plot of Foe plays on some fairly common science fiction tropes. Terrance, the interloper, has come from OuterMore, a company that is developing communities in space. In order to test these communities and to be completely fair, OuterMore and the government have run a lottery and those selected through the lottery are required to participate in the test. Terrance has come to announce that Junior is on the long list of those selected, if he is put on the short list he will have to leave his wife Henrietta, or Hen, behind. When Terrance returns a few years later to confirm that Junior has been given a spot in the test, he comes with an additional mission. To support Hen while Junior is away, the company will provide a simulacrum of Junior. A fully functioning android which will look and behave like Junior. But in order to build this fake Junior, Terrance has to move in for a few weeks to interrogate, measure and probe the two of them. We’ve returned to our natural tempo. We work; we eat; we sleep. Life finds a way of balancing out. This is what we desire as humans – security, certainty, affirmation. At the same time Reid is interrogating what it might mean to be a human being. What aspects of life might we wish to harvest if we were indeed trying to make a copy of someone. What memories and activities are essential to build up a life. There are a couple of twists in the tale, many of which, for readers of science fiction will come as no surprise. But given the deeper layers of the story, surprising the reader is only one aim. The more critical purpose of these twists, and the real interest for the reader, is watching how the characters react. Because the revelations come more as a gut punch to some of them. At times Foe feels like an old fashioned tale. There are echoes of Kafka or the early works of Iain Banks in the bizarre unexplained processes happening around the couple. The farm itself exists in a bubble of isolation and very little of the outside world is explored or explained. But there is also a Black Mirror or Twilight Zone feel to the scenario, almost a thought experiment played out on real people. All of this ambiguity focuses the attention more on the characters and makes Foe a tense, unsettling and thought provoking book.